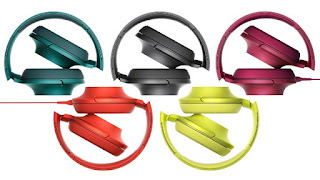 Sony Electronics announced new High-Resolution Audio (Hi-Res Audio) compatible headphones for the US market that come in five vibrant colors: viridian blue, cinnabar red, charcoal black, lime yellow and bordeaux pink. Sony ignites the fire in its audio line-up with these stylish "h.ear on" headphones in an exciting array of colors that deliver bold, distinct design together with superior sound quality and a comfortable fit. Available in November for about $199.99. Sony makes it possible to enjoy higher sound quality music by applying unique audio technologies that bring listeners closer to the spirit and intent of the artist's original performance. The new h.ear on headphones join a growing line of Hi-Res Audio products designed to equip consumers with the best portable products to enjoy a fully immersive, Hi-Res Audio experience. The h.ear on headband-style headphones deliver Hi-Res Audio compatibility with 40mm HD drivers which reproduce sounds up to 60 kHz. Augmented bass is complemented by lightweight CCAW voice coils which yield high-linearity responses in high-pitched sounds. Aiming to provide a superior sound experience, the domes of the acoustic diaphragms have been titanium-coated to minimize unwanted vibrations. Meanwhile, Beat Response Control improves the transient characteristic in bass reproduction and delivers accurate rhythm, while an acoustic port on the housing controls air flow for optimal diaphragm movement and additional bass range. A ground separated cable reduces cross talk and is balanced compatible for balance output supported equipment. Draped ear pads provide a comfortable fit and prevent sound from leaking, which also helps the h.ear on headphones deliver powerful base reproduction. The color-coordinated cable is detachable and an in-line multifunction button and microphone allows hands-free phone calls with smartphones that support that functionality. The headphones also fold easily for secure storage in the supplied carrying pouch. 0 comments on "Sony Electronics' h.ear on headphones announced for the US market, come in 5 vibrant colors"